Dying hair un natural color? I have blondish brown hair and a lot of my friends want me to dye my tips purple, blue , or pink or my whole head a pastel pink/ silver grey? Your thoughts. No please, don't do it. You're hair is great right now, I like the transition from brown to blonde that you have right now. Plus, I don't like dying the hair of a different color that's not a natural one. Should a girl wear a crop top if she has a chubby belly bulging over her jeans? What is your favorite color t-shirt that girls/women wear and why? What do you think of the girl in this videos body? Is there such thing as objectively ugly? Opinions on her outfit? no! your hair is gorgeous now. I personally don't like unnatural hair colors, but maybe that's just me. "A lot of my friends want me to..."
First off, do you want to dye it? If you are not willing to dye it, don't so it because of peer pressure. If you want to try it though, go for it. Unnatural hair dye fades away pretty quick though. Go for it! Do it while you still can. There's just certain things you can't do when you get older, do it while you're still young! dooo ittttt! i've done that a handful of times and it always looks really cute. you should start off with just your tips so you get a feel for a crazy color first. it'll give you time to decide if you really like it a lot. and if you do, you can do your whole head too. but it's very hard to get unnatural colors out of your hair. just so you know, it takes a lot, and it'll be damaging to your hair to get rid of the dye and then dye back over it. 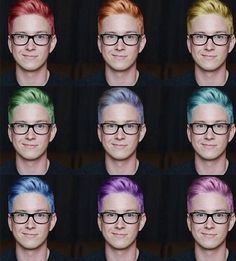 honestly if you just get the ends done, and decide the color is weird or you dont like it, it's way easier to just cut them off or dye over those, rather than your whole head. :-) i recommend splat hair dye if you decide to do it. that stuff works awesome for me. i dyed my ends and the lower half of my hair pink, and it was super bright and vibrant and very pigmented. and it literally lasted for 6 months, before i chopped it off. it faded to a reallly pretty pastel pink. good luck!! With everyone doing it these days I think it's just plain stupid. Leave your hair the way it is okay? :). I don't like unnatural hair colours, but then again I am an old fart compared to you. The guys your age may like it, who knows. Not everyone can “love themself” A Celebration of Hair Why I am racist to my own race and why religion should be separated from the law My experience: 15 major differences between Middle Eastern + North African men and Western Men 10 Benefits to Why a Girl Shall Stay Virgin Until Marriage! Home > Fashion & Beauty > Dying hair un natural color?